The General Motors Rochester Throttle Body Housing is OEM original equipment. Each TBH comes complete with a new aluminum oxide finish and new throttle body bushings. Every Throttle Body Housing is Flow Bench tested to ensure a consistent idle setting. 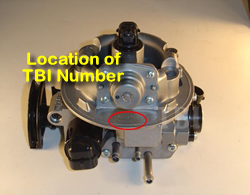 To ensure the same OEM Throttle Body Housing for the vehicle please enter all the required information about your TBH and vehicle in the text boxes below and then click the PayPal icon to place your order. has core damage, please list damages in this box.